Okay, this is kind of a rant on a couple of issues. 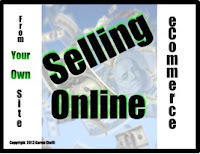 I sell e-products on my website via PayPal, as part of my online marketing strategy. While this is a convenient and normally great selling method, once in a while there’s a problem. This, I guess, is the way with ecommerce. PayPal, for whatever reason they deem necessary, makes it very unclear as to how to download your purchase once you’ve bought it. This in no way is the consumer's fault. PayPal just uses a confusing way to provide the ‘instant’ downloadable link to the product you bought. It gives the transaction number and notes that they’ll send you a receipt via email. NO WHERE does it say: Click Here to Get Your Product, or other clear call-to-action. The buyer must automatically know that one of these three links is the product download button. Just so you know, it’s the first link – the link to “Return to [the seller’s email address]. How is anyone to know that’s the link to get the purchased product? Because of this confusing process, I’ve had a couple of people who have filed a dispute against me with PayPal over the years. While they have been quickly resolved, it’s annoying and time consuming for me, the seller, and for the buyer. Fortunately, I was able to get online and check my email to find the problems. BUT, when super storm Sandy hit, I was without electricity for almost two weeks. And, I couldn't drive anywhere for internet access. What happens then? What happens if you have a problem with your internet service or electricity? Or, if your computer crashes. PayPal needs to develop an easier method for buyers to be able to quickly find the download button. People get upset when they can’t immediately get their purchases! This leads me to the second rant. My most recent mishap with a PayPal purchase just happened. 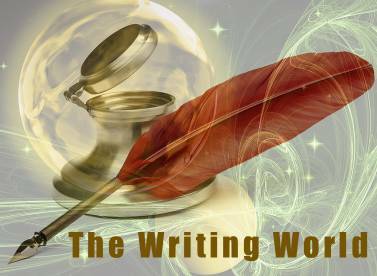 I promoted a product related to the content in my newsletter, The Writing World. Happily, subscribers found the product to be helpful and I got a number of purchases. This is GREAT and I appreciate every sale, but . . .
One buyer, after 'not being a mind-reader’ and realizing she needed to click on my email address to get the ebook, filed a dispute with PayPal. Now, I can understand the frustration in buying a product, even at $7, and wanting it immediately. However, I buy e-products online also and my first course of action if there’s a problem with the download is to contact the seller, not file a dispute or complaint. To add to this, the people buying were buying from a promo in my newsletter. These are people I send useful writing and marketing information emails to regularly and offer free webinars to. As you can see by the receipt below, I paid the $7 for the eBook "Editing Books Like A Pro" , however, I have NOT YET received the instantaneous download as promised. Please send immediately! I, of course, immediately sent an email apologizing for the inconvenience and attached the ebook. Then I had to go to my PayPal account and let them know I took care of the matter. Then, annoyed over the matter, I created a test .49 cent product, uploaded it to PayPal, put it on my site, and bought it through my husband’s account, just to test the buying process. I have to say the PayPal 'download process' is sorely lacking. After that, I wrote this post. So, thanks to PayPal, for a $7 product I wasted well over an hour and a half. I'm sure I'm not the only PayPal merchant this occasionally happens to. PayPal is making enough money from its merchants; they should make the buying process much easier and clear. Aside from this MAJOR problem, I'll still use PayPal, at least for the time being. Want to learn how to sell products and services through PayPal, right from your own site? 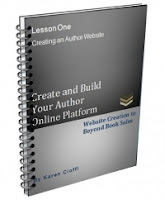 Then you need Create and Build an Author/Writer Online Platform - Website Creation to Beyond Book Sales. One of the Lessons covers using PayPal to sell your products. For more all the details, CLICK HERE! Content Marketing and Content Creation can be leveraged into a constant flow of prospects and profits. It's still the best way to build and online business from scratch and create all the prospects and profits you want. And you do want more prospects and profits, right? The internet runs on content. Text is content. Audio is spoken content. Video is spoken and viewed content. Social media is content in small chunks. The internet runs on content, and always will. No matter all the people who would like to fool you into believing otherwise, so they can sell you their latest "here-today-gone-tomorrow" flavor of the month. I'm going to make this really very easy for you. Pick a specific topic in your niche. The more specific the better. Come up with either 3 mistakes to avoid or 3 tips to do. Based on your content, create a compelling title to pull in your prospects. Then craft a call to action that shows your prospect exactly what to do next and what's in it for them. While the above is a bit simplified, that's basically it. I could complicate it for you, but why? Now that you've created your content, what in the world do you do with it? Get your content in front of as many hungry eyes as possible. Hungry eyes that want what you are offering. This is called smart marketing. 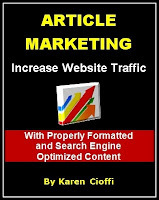 Article Directories - There are these great web sites called Article Directories that will host your article and include a link back to one of your sites at the end of the article, just like as the end of this one. Your Blog - I recommend not putting your entire article or piece of content on your blog all at once. Break your content up into a blog post series. 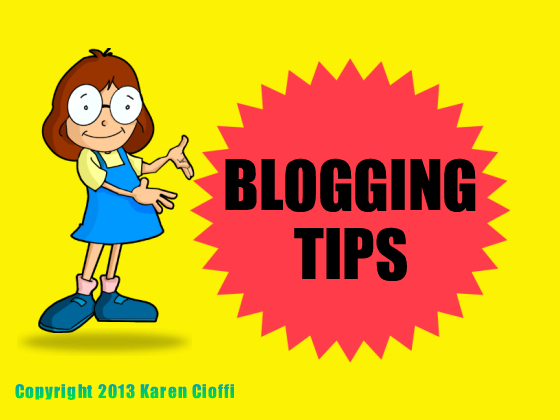 If you are offering 3 tips, make it a 3 post blog series. 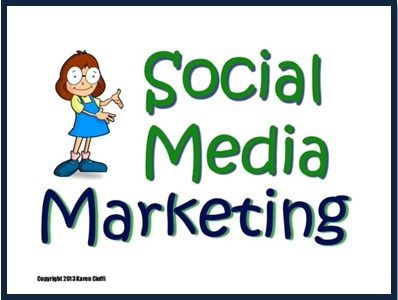 Social Media - At the time of this writing, here's a brief glance at the amount of traffic Social Media is pulling in: Facebook is the #2 most trafficked website, YouTube is #3, Twitter is #9, and LinkedIn is #12. Why wouldn't you want to get your content onto these top ranked sites? TeleSeminars and Webinars - Repurpose your content into online events like teleseminars and webinars. The strongly builds your online presence and increases the trust your prospects have in you. If you’re an author or freelance writer, you will occasionally need the services of a professional editor. When this occurs, it’ll be a good idea to know what types of editing your manuscript or article may need. Below are three types of editing. Hopefully, the descriptions will give you an idea of the differences between the three. Substantive editing is time consuming and if this is what you need, keep in mind it can take up to four weeks for an editor to thoroughly go through your manuscript. NOTE: It often happens that the author doesn’t realize the needs of her/his manuscript. If you start with line editing, your editor should let you know if it’d be a good idea to ‘take it up a notch.’ Obviously, it’s the author’s choice though. What’s the point of paying for line editing if the story’s structure needs an overall. Looking for a children's book editor or ghostwriter? Everyone who wants to sell a service or product or who simply wants a place to voice their thoughts and opinions needs a website. This includes authors, writers, and marketers. While websites come from a number of sources, free and paid for, it’s the ones with paid hosting that offers the greatest support and freedom. I use Bluehost for all my website hosting needs and I appreciate their service so much, I’m an affiliate for them. And, currently, it's only $3.49 a month for 36 months. This is an amazing offer. So, if you’ve been procrastinating about signing up with a hosting service, or if you’re new to writing and marketing arena, you should absolutely take advantage of this special pricing. If you’re not sure what the difference is between free hosting and paid hosting, let me explain. Free hosting comes from services like Blogger.com and Weebly.com. The do provide some useful features, but they are lacking compared to paid services, like Bluehost. For example, with Blogger you don’t have the ability to optimize your images and you’re limited to 10 pages per site. When it comes to SEO, this is a big deal. With Weebly, you are only allowed up to six pages per site. With Bluehost, you can create as many pages as you want on your site. And, there are unlimited domains on ONE account. This means if you sign-up with Bluehost, you can create as many websites (with different domain names) as you like. I currently have about 10 sites. In addition, freeservices don’t have support if something goes wrong with your site, or if they do, it’s a pain-in-the-neck: difficult to find, difficult to navigate and difficult to get prompt answers. One of the other BIG differences is Google loves WordPress and most free sites don't support it. This will affect your SEO efforts. This folks, is a no-brainer. If you need a website this is the time to get it. If you choose the 36 month plan, you pay only $3.95 $3.49 per month! And, to make this special offer even better, if you order through me, I’ll include my Create Your Author-Writer Online Platform eCourse.. You can check it out at: http://www.karencioffi.com/author-online-platform-ecourse/ (scroll down to the Options section). Just send me your receipt. I’ll verify it with Bluehost and then send you your bonus ecourse! GET YOUR BLUEHOST WEBSITE HOSTING TODAY! Just a note on something I'd like to share before I begin: I used Grammarly.com to check this post. As a writer I want to put my best foot forward, Grammarly helps me do that while saving me time! Okay, on to the article. Content curation has been around for a while, but many bloggers don’t realize the advantages or benefits it offers. This form of marketing comes in various forms throughout the internet. Of those variations there is one common thread: Content curation is related to article marketing, or more specifically to content marketing. You can think of it as one of the strategies under the content marketing umbrella, the same as content aggregation. Well, content aggregation is simply finding and linking to hot topics, trends, and other news or information worthy content from your site. Some sites use all sorts of topics and others use content that is focused on their platform. Content curation on the other hand offers more. While linking to the information source, those using this strategy add their own spin on the information, or enhance it with personal experience or additional information on the topic. The information used for content curation is targeted and so is the audience it’s prepared for. As an example, if you have a health site on alternative medicine and alternative health options you would search for and use information/content on that topic or niche. You obviously wouldn’t use sports content on your site. It’s treated as any other niche marketing strategy – it must be focused to your platform or brand. By taking advantage of content curation, you offer a broader view and understanding of a particular topic by providing your own input and that of the source content. Now on to the five reasons you should use this blogging strategy. 1. Simply put and most importantly, it brings your readers more ‘bang’ for their stop at your site. Rather than offering a single view of a topic, or one site’s experience, you offer your reader the world and a broader information experience. The reader will appreciate having more information to work with and this will motivate him to appreciate and trust you. That’s the beginning of a great relationship. 2. It’s a source of ideas for your blogging. Find current trends, hot topics, and new information in your niche. The content is already there, you simply add your spin on it in a paragraph or two and voila, you have new a new post. 3. It’s a time saver. Using tools like Google Alerts, you can quickly find relevant information to blog about. And, like ‘number two’ above, it’s ready made content you simply add to. 4. It can support or enhance your own blog posts, adding more value. Even if you write effective and engaging articles, the reader will find it helpful if you supplement it with additional information. 5. Linking to quality sites is an effective search engine strategy. When you link to a site that ranks high with Google, you’re noticed. 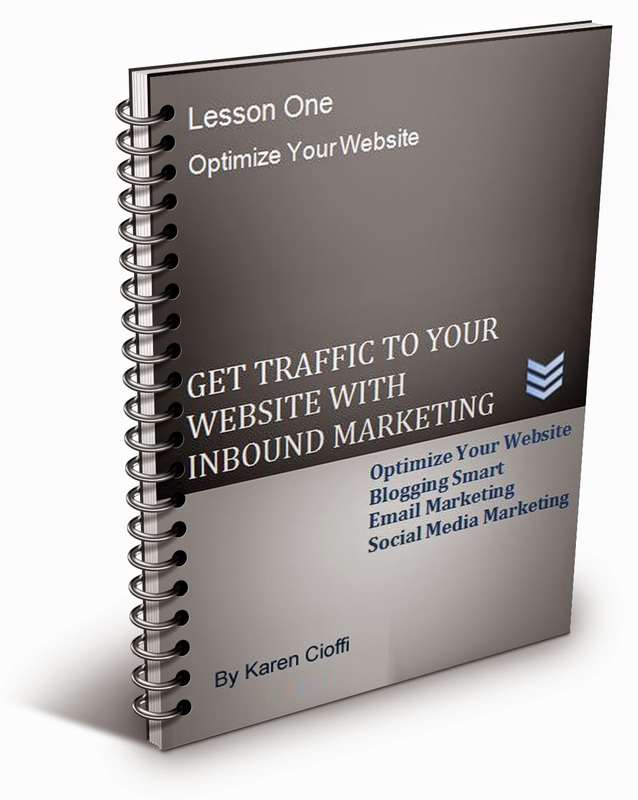 It can help bring more traffic to your site and help convert visitors into subscribers. And, that’s what online marketing is all about, the ‘golden’ list. Content curation will boost your blogging efforts. You don’t have to use it for every post, but you can switch it up a bit and offer your reader something extra. Book reviews are a double-edged sword. On one side of this marketing sword, the strong positive reviews may help catapult their novel to top of the book sale charts. However, on the other side of that sword is a sharp blade that can cut deep into the author's reputation and morale, sending their novel to the basement in Amazon ratings. I've found there are two basic types of reviews. One type is primarily objective. It's based on the construction of the story, assessment of the writer's talent in developing characters and plot, theme, flow, dialogue, accuracy of details, completeness of the editing. It is an objective critique of how well the story was written. These reviewers will provide more information related to cause and effect. For example: "The point of view shifted quickly between three characters making it difficult to follow the action." This type of review is generally provided by a professional who is trained and experienced in writing. I've received dozens of reviews, most of which are very positive. Any worthy negative comments are from professional reviewers I respected. Their feedback provided insights on how I can improve my writing. As a result, I benefit from their expertise. The second type of review is primarily subjective. The reviewer provides an assessment on how they reacted to the story, how much they liked or didn't like the characters, plot, climax, and sometimes the ending. Their report is based primarily on their feelings, rather than on the construction of the story. These reviewers may be someone who regularly reviews books for authors, or a customer who read the book and has no reviewer reporting experience. Both review types serve a purpose. The objective review will point toward the author's writing talent; the subjective will focus on the reader's enjoyment of the story. A story can be well written but may appeal to only certain type of reader, or may be loved by a wide range of people. However, a novel that is poorly constructed will likely fail to impress any reader, regardless of the genre. Let's look at the world of reviewers. An author will have to do research to find the kind of reviewer that will suit his/her novel. Research will include looking for reviewers who specialize in a particular genre. It is important to read the reviewer's previous reviews to determine if their focus is on an author's writing knowledge and skill, or if they focus on how exciting the characters and plot are. Many receive more requests for reviews than they are able to accept. There is no standard on how a review should be written. Reviewers are not paid for their assessment and posted reviews. This reduces the chance of a person being paid to fabricate a positive review. Anyone can to claim to be an authority on how a novel should be constructed. Some reviewers have built a reputation for being the 'go to' people for honest, unbiased, and professional reviews. 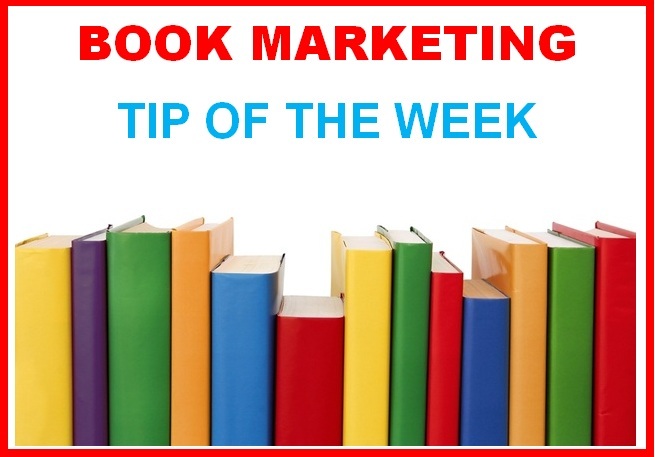 Others are new to the industry, but show great enthusiasm of becoming the authority on what books you should consider buying. One of the challenges in being an author is that many times, if not most of the time, you do not get to choose who posts a subjective review of your book. Anyone who reads it can post a review, which is wonderful. The problem is that a subjective review can be misleading, and sometimes malicious. Writing a review is challenging. The reviewer wants to report their findings/issues/feelings without disclosing key elements of the story. Unfortunately, there are occasions when subjective reviewers post details about the story's plot, all the twists, and even reveal the ending. This is unprofessional and disrespectful to the author. I believe a subjective review is secondary to the assessment of the (a) writer's talent in development of characters, (b) brilliant construction and execution of the plot to its conclusion; (c) depth of scenes and dialogue, and (d) if the editing was thorough. Subjective reviews are very personal. Every author loves to hear from a reader, especially if the reader loved their book. For the readers who are less enthusiastic, authors welcome those comments as well - so long as the communication is respectful. If an unsatisfied reader comments, it is beneficial to explain why their feedback is negative (not their kind of book, didn't like the characters, too little action, etc.). How much emphasis should there be on reviews and ratings? From what I'm learning, readers more often select their reading material from a variety of sources. Reviews, it appears, is a relatively minor source compared to the book's synopsis. Some readers have reported they don't trust the reviews and ratings, especially the ones reporting a 5/5. They suspect friends and family might have been the source of those ratings. If the synopsis appeals to them, they often read a few randomly selected pages. In short, readers will wisely do their own review. The book publishing industry is being challenged by new technology. 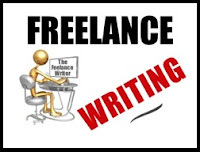 Now anyone who has written a manuscript can self-publish with greater ease than before. It may be a masterpiece, or the author may have poor writing skills and skipped the editing. Note: many self-published authors write first class books. Whether a book is published through traditional or other avenues, the book industry and authors need be conscious of risks to writing standards. Reviewers play an important role to maintain (or improve) the quality of books available. Thank you to all the reviewers who burn the midnight oil reading, care about the world of the written word, and honor authors with your time and wisdom. Whether you’re a freelance writer, an author, an online marketer, or other, you need a computer. And, you need a place to store your files, pictures, videos, applications, and so on. In the 90s, the computer was all about speed. You wanted enough MHz to do what you wanted or needed to in as short a time as possible. If you can remember the old dial-up internet access you can understand what I’m talking about. And, then you had to hope that all the lines weren’t being used or you’d have to look for another phone number to use for access. In a blog post, Matt Cutts pointed out that speed got fast enough in the late 90s, and the focus then changed. Since speed was captured, next up was the size of your “Intel or AMD chip.” The size or capacity, which is actually a better word to use, determined how much data you could store on your hard drive. The more space the better. I remember upgrading to a new computer each time the memory capacity of my old computer was at its limit. I needed more and more space. Of course, now and then came the harrowing crash or unexplained lost files that would put me in tears. That’s when the use of the personal zip drives grew. There were many sighs of relief. Those who were smart backed up their new data every night, but unfortunately, even zip drives can crash. More tears. 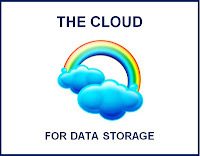 Then, somewhere around 2010, the cloud and network storage for personal use came along. Computer capacity could no longer meet the demands of data. People needed something bigger and better and safer, and companies met the need. Today, most people use a service like Google docs or Dropbox to save and access their data. And, they can do this from different locations and on multiple devices, making it very convenient. I use Dropbox and absolutely love it. The one drawback I’ve found when working directly from a storage network is if you come across a problem, the data is lost forever. An example of this is when the delete button on my laptop got stuck. YES, it was stuck and I couldn’t stop it. I watched as each character, sentence then paragraph I was working on disappeared. I frantically hit the Esc key. I tried Ctrl-Alt-Del. Nothing worked. Finally, the entire document was gone. If I was working from my hard drive or a zip drive I could have restored the document from my storage network, but that wasn’t the case; I was working directly from Dropbox. If I had thought fast enough, I could have closed the document after it disappeared, without saving it, but panic set in and I didn’t think. So, puff, it was gone. This happened to me twice. I have since removed the top part of the delete key and it hasn’t gotten stuck since (fingers crossed). It doesn’t look too good, but it works. Interesting, the experience hasn’t stopped me from loving Dropbox. I just try to be more careful now and try not to panic when something goes wrong. And, as an extra safety net, I also have a Carbonite backup plan. I also occasionally backup my files to a zip drive. Paranoid? Maybe. But hey, better safe than sorry. 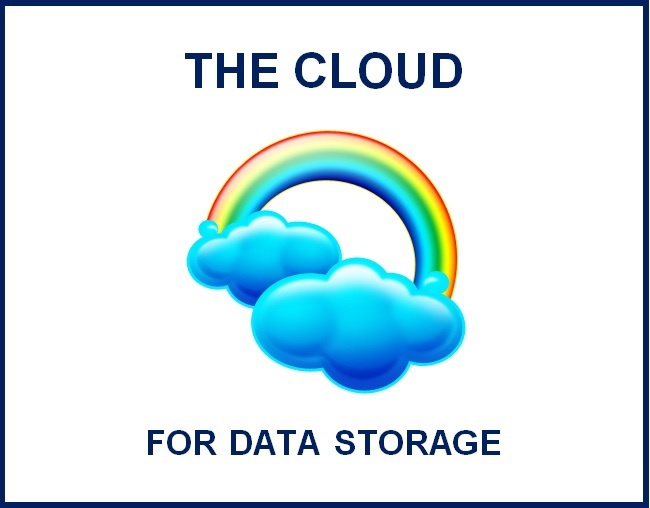 What data storage and backup strategies do you use? Content Marketing – Is Blogging Worth the Time and Effort? Some people put up blog sites to market their own products or themselves and others put up blog sites to market other people’s products. The latter can be done using a traditional advertising model, where you simply sell advertising space or it can be done through affiliate marketing or even other arrangements. If you’re going to market other companies or products, here are some things you have to do. Banner ads and other types of directly-purchased advertising that’s placed on websites has to be placed in good locations and be eye catching. Some WordPress themes come with features that make it very easy to place advertisements on pages and these are better solutions than actually trying to place ads manually on your own. It’s a good idea to make sure that your advertisers don’t expect you to create the ads for them unless this is something you’re set up to do. If you’re not a graphic designer, you’re not set up to do it. You’ll have to give them ad size specifications and you can price your ads based on the size, how much they run and where they appear on the page. You have to have a viable venue for your advertisers to get their products seen in before anyone’s going to want to buy space from you. 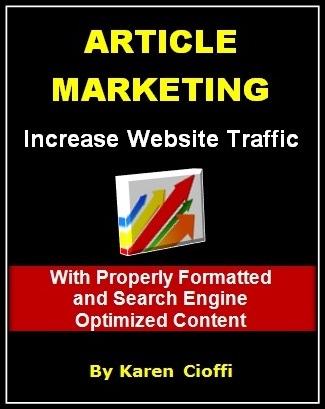 Many online marketers are going to use PageRank as a way to determine whether or not your site is viable at all. It might not be worth it to start trying to sell ads until you have at least a 3 for a PageRank score. The higher your PageRank goes, however, the more you can charge for advertisements. Advertorial content is content that you generate that’s designed to pitch a product but that also has some use to it. In this regard, it’s very similar to most SEO writing, but it tends to be a bit more direct about the fact that it is pitching a product that readers can buy. You might want to add this service to your advertising options or, if you’re comfortable with it, charge advertisers to run their own content on your site. Make sure the content that they want to run is up to the standards of your site, however, as some advertisers will try to run awful content if you don’t make it clear that there are standards they have to meet. Anny Solway is a dedicated writer at ThemeFuse. 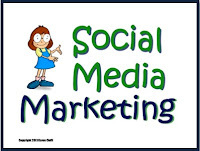 She likes to discover new ideas about internet marketing, social media and blogging. Twitter is one of the top 2 social networking sites in the world and, according to this statistic, as of May 2013 there were over 550 million registered Twitter accounts. Although many of those are not active users and are merely “following” the tweets of famous celebrities, friends and brands, there are still 58 million tweets counted each day, and for each second that passes there are 9,100 tweets tweeted. With such high numbers, businesses left and right are taking the opportunity to use Twitter as well. Here, they can accomplish so many things at once: market their goods or services, interact with loyal customers, attract new patrons, branding, and maintain a constant online presence, among others. It doesn’t take an SEO company to create a Twitter account, but having one would definitely be helpful in managing followers and tweets. All of these are excellent goals; now the question is, are businesses doing it right? The environment in Twitter is very personal and intimate. Each tweet is ideally written by a person who wants to share short messages with friends and followers. Each Twitter account is associated with an individual. This is why it is often better for businesses to treat their tweets as a message from a real individual, or at least to take the tone of a real person typing genuine messages. 1. Followers will feel gratified that the business or brand they are following closely is taking the time to pay attention to their tweets. That often translates to better results, as far as business PR is concerned. 2. It creates a candid atmosphere and a more personal interaction between business and customers. People will feel more comfortable tagging your business or tweeting you directly. Other than saying that as a business you ought to “speak” like an individual in Twitter, it would be difficult to tell you precisely how to tweet your messages. What works for one business may not work for every other business. For instance, while it would be easier for Starbucks to be very casual and friendly to its followers, CNN cannot really take the same tone of voice. So, below we have the common mistakes businesses often do with their tweets. If you know what not to do, then there should be a good chance you’ll end up doing the right thing. 1. Adding too many hashtags in one tweet. Not only are they distracting, because each hashtag breaks the flow of reading and the words are highlighted, they also run the risk of being recognized as spam. 2. Replying fan and followers’ tweets using automated responses. Followers can tell when a reply is automated, and they are often dejected and discouraged when that happens. Take the time to compose a brief and honest reply to your followers’ tweets. They’ll be more responsive and welcoming of your future tweets if you do this. 3. Mistakenly tweeting a wrong message. This is in conjunction with the previous item. There’s always a possibility that your tweets will get screwed up. 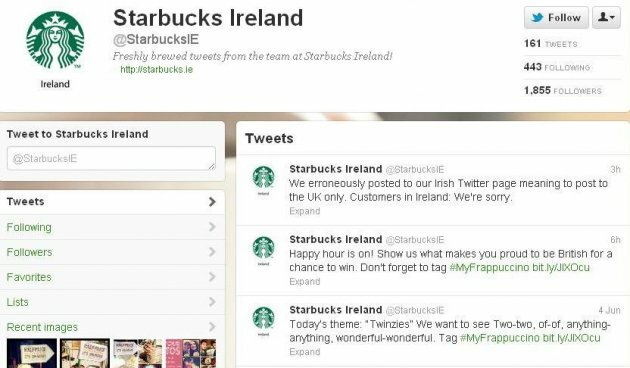 Or, if your business has opened branches in various states or countries and you’ve made a Twitter account for each of them, you might mistakenly switch tweets—like what happened with Starbucks Ireland’s Twitter gaffe in June 2012. 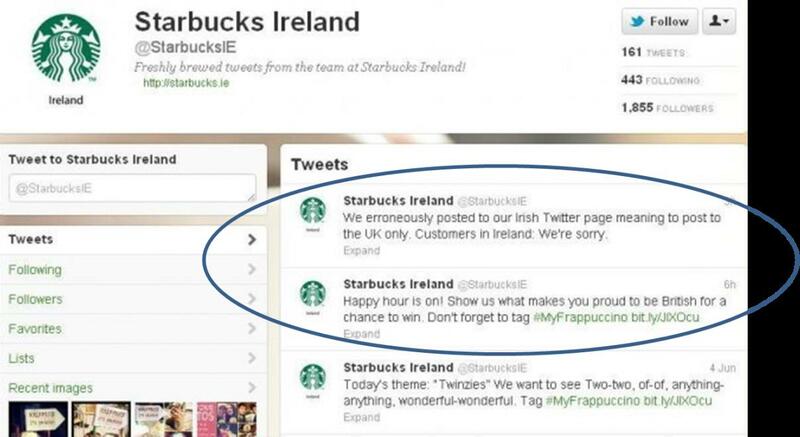 Caption: Starbucks Ireland mistakenly referred to followers as British, much to the Irish’s ire. 4. Promoting your business too much. When you speak of nothing else but how great your products or services are, you come across as promoting and sales pitching, and people in social media don’t like that. 5. Tweeting 10 different messages or more in rapid succession. It hits too close to over-promotion because it gives the impression that an employee is tweeting messages composed ahead of time. Plus, it will flood the walls of your followers and possibly irritate them enough to stop following you. Lastly, think about what types of tweets you yourself would want to receive from the brands and celebrities you follow. This exercise can help you develop a candid and level plane of communication between you as business entity and your customers.